John Cadwalader, the son of Thomas Cadwalader, was a man of great prominence during the American Revolution. He attended the Academy and College of Philadelphia from 1751 to 1758. Although he entered the College of Philadelphia with the class of 1760, he did not graduate but instead left to organize a very successful mercantile business with his brother Lambert Cadwalader. From the earliest days of the American Revolution, John Cadwalader worked to persuade others to protest in favor of colonial liberties. He became a member of Philadelphia’s Committee of Safety and captain of the City Troop or “Silk Stocking Company.” He was later appointed brigadier general of the Pennsylvania Militia and commanded the Pennsylvania troops during the winter campaign of 1776-1777, in which he crossed the Delaware with Washington and engaged the British in the Battle of Princeton. As the war progressed, he was instrumental in forming a militia from the eastern shore of Maryland; with this militia he rejoined Washington as a volunteer to fight the Battles of Brandywine, Germantown, and Monmouth. 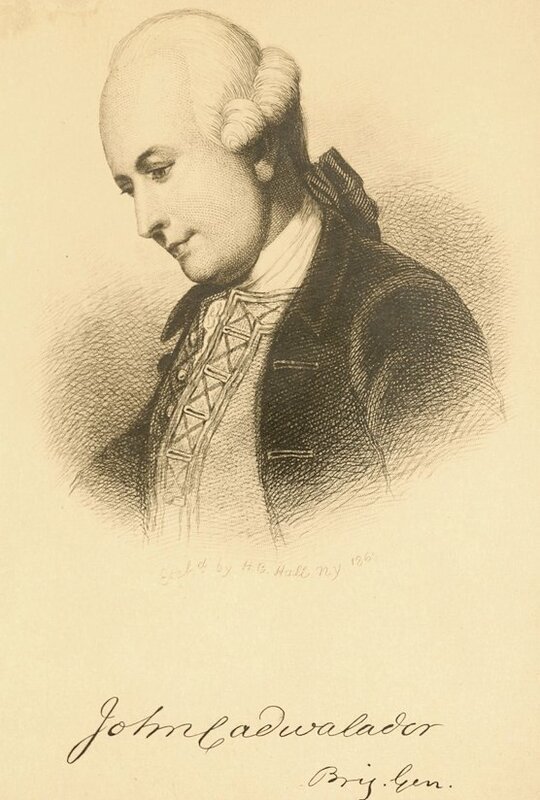 After the British evacuated Philadelphia in June 1778, Cadwalader fought a duel with General Thomas Conway, who had been accused of plotting to remove Washington from command of the Continental army and whose conduct toward American officer was considered “offensive” by Cadwalader. Cadwalader gravely wounded Conway, but Conway did recover to write a letter of apology to Washington. In 1779, the same year he was elected a trustee of the Academy and College of Philadelphia, Caldwell also became a member of the Maryland Legislature. He died in Maryland in 1786.